Whilst this wasn't the greatest RAW in WWE history, it was a huge improvement on last week's episode which we covered in our previous blog post. The show was scheduled to begin with Chris Jericho's Highlight Reel starring special guest Randy Orton. 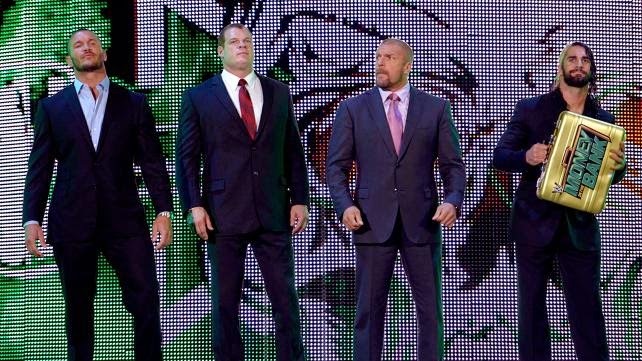 Orton did make his way to ringside, but with Triple H, Kane & Seth Rollins in tow - suited and booted! Apparently Triple H had decided that it might not be best for business for John Cena to face Brock Lesnar at Night Of Champions, and he is considering naming a new #1 contender for a title shot at Lesnar. Cue everyone who's everyone try and claim their place as the new #1 contender including all of the men in the ring (bar Triple H) before John Cena came stomping out to ringside to make his point. Cena claimed that it is his legal right to rematch against Lesnar and if he doesn't get it then he will sue! Then Roman Reigns made his way (through the crowd - obviously) to ringside to stake his claim for being the #1 contender. What? You didn't think they'd leave him out did you!? In the end Triple H decides that all of the men in the ring will get a chance to prove themselves in the main event of RAW - Cena, Reigns & Jericho vs Orton, Kane & Rollins - Six-Man Tag. That's more like it, WWE! The first match of the evening was Dolph Ziggler & Sheamus vs The Miz & Cesaro - accompanied by Damien San(Miz)dow and a makeup artist! Next up, another tag team match in the form of Mark Henry & Big Show vs Luke Harper & Erick Rowan - As we were reminded by Michael Cole - That's 1,400 pounds of human meat/Mark Henry's copious amounts of sweat. Mark Henry had Harper in his arms ready for the 'World's Strongest Slam' but Rusev entered the ring and kicked Henry square in the jaw - And there was us thinking he was just innocently interested in watching the match! Meanwhile, Rusev's old foe Jack Swagger was in singles action against Curtis Axel, forced into singles action due to the fact Ryback is out of action. Incredibly, Swagger managed to pick up the win! Not due to the quality of his opponent, more the fact he hasn't won in about 2 years! Ok. Slight exaggeration there - but it did feel a bit like he was just being used as Rusev's punchbag for a couple of months. These days Swagger has himself a new rival in the form of Bo Dallas. We imagine Swagger is absolutely THRILLED by this - But heck. At least he may now win the odd match on a PPV! Rusev won - Mark Henry made his way to the ring - Rusev retreated. What a chicken! (although we wouldn't call him that to his face). The Diva's division has just been given a brand new lease of life as Stephanie McMahon revealed that she was going to hand Nikki Bella a shot at Paige and her Diva's title. Brie Bella was next out from behind the tron to exactly the same music as her rival twin sister. This was referenced by Steph who proclaimed that from now on the Bella's music is only to be exclusively used by Nikki Bella. Nikki was generally horrible to her, about her and her troll-like husband Daniel Bryan - Her words, not ours. Then AJ came to the ring claiming that she was owed her title rematch against Paige. Then Paige herself entered the fray as they couldn't have this conversation without the champion herself being present. Nikki then took the microphone to suggest that her twin sister leave the WWE as a kind of sacrifice - Basically in the same kind of way she did for her husband, Daniel Bryan. As she continued screaming at her sister to "leave", Brie finally snapped and pushed Nikki over into Paige who then dropped the Divas title, giving AJ the chance to seize the belt and skip around with it in circles! Gold & Stardust are now bona fide bad guys. We like this. It adds something to the tag team division. For the first time in ages we have a feud between two tag teams, who actually look like tag teams! Credit where credit is due - WWE Creative did good when coming up with the 'Stardust' character. This time round it was Goldust in action against Jimmy Uso (We think.You can never be 100% sure). Goldust picked up the win after hitting his 'Final Cut' finisher. But despite the win being clean, what happened next was very much the opposite. Both of the Rhodes Bros went after poor little Jey Uso's bad knee. Firstly issuing a kneebreaker and then wrapping his leg around the ring post and smashing it with a steel chair. Ouch. 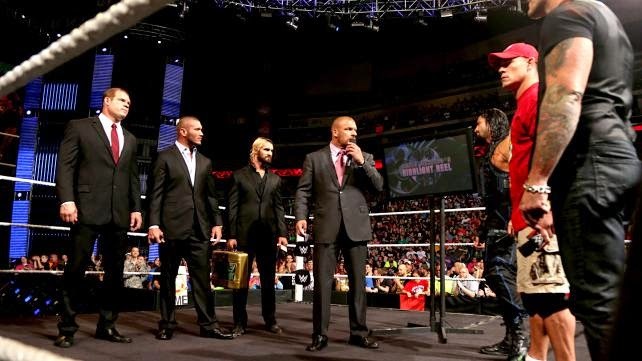 Next up was the main event - Cena, Reigns & Jericho vs Orton, Kane & Rollins. This match was a VAST improvement on the main event we were served up last week on RAW. Big names. Fast paced action. Near-falls. Different Superstars finishers being hit in quick succession. This was certainly good enough to pass as a main event on RAW. Much more like it! Both Reigns and Y2J spent lengthy periods in the ring before Cena was let loose towards the end of the match. As predictable as this is - The crowd erupted. As for what happens with Triple H planning to change the #1 contender - Who knows? I would imagine that nothing will come of it and the Cena/Lesnar rematch will go ahead, as planned, at Night Of Champions. Good on the WWE for FINALLY forward selling what is coming up next week on RAW. They always forward sell what is coming up on Smackdown, but let's face it, RAW is their flagship show. By forward selling, I mean actively advertising what matches are coming up next week on RAW. By doing this we now know next week will include Reigns vs Orton is a SummerSlam rematch PLUS Jericho vs Wyatt in a steel cage. If I was a gambling man, I'd wager that by making those simple announcements, they have just added THOUSANDS more viewers onto their ratings for next week's show.